"I'm assuming this doesn't end well…" Netflix has revealed one final trailer, the fourth in total, for David Ayer's new fantasy action cop movie Bright. Yes, this isn't out just yet - arriving December 22nd right in time for Christmas. Starring Will Smith, this is set in a world where other creatures like orcs and elves co-exist with humans. Joel Edgerton co-stars under the make-up as "Nick Jakoby", who is assigned to him as his new partner. The cast includes Noomi Rapace, Kenneth Choi, Brad William Henke, Lucy Fry, Edgar Ramírez, Ike Barinholtz, Brandon Larracuente, and Dawn Olivieri. As fun as it is to watch more footage from this, I'm ready to see it and find out if there's actually a good movie here or not. Dive in. You can still watch the teaser trailer for Bright here, or the second trailer, third trailer, BTS featurette. In an alternate present-day where magical creatures live among us, two L.A. cops become embroiled in a prophesied turf battle. 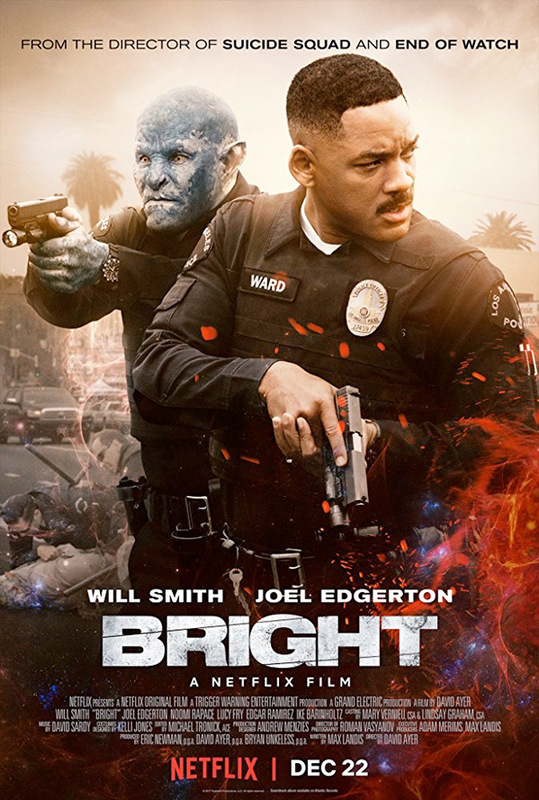 Bright is directed by American filmmaker David Ayer, of the films Harsh Times, Street Kings, End of Watch, Sabotage, Fury, and Suicide Squad previously. The screenplay is written by writer/director Max Landis, of Chronicle, Me Him Her, American Ultra, Mr. Right, Victor Frankenstein, and "Dirk Gently's Holistic Detective Agency". Netflix will release Ayer's Bright exclusively streaming online starting on December 22nd during the holidays. You can add the film to your list already. Your thoughts?